From THE BEN FRANKLIN BRIDGE: Follow Rt. 30 to Rt. 38 East passing Cherry Hill Mall on left and Moorestown Mall on right. Then follow Moorestown-Evesboro sign around jug-handle (to turn Left) and proceed across Rt. 38 into Moorestown on S. Church Street (Rt. 607). From THE WALT WHITMAN BRIDGE: Take N/S Freeway Rt 42 to I-295 north toward Trenton. Take Exit 36A for Rt. 73 South, then take the next jug-handle on right to Fellowship Road north, crossing Route 73. Proceed on Fellowship Road to its end at Church St. (Rt. 607) turn left on S. Church Street and proceed into Moorestown on S. Church Street (Rt. 607). From THE TACONY PALMYRA & BETSY ROSS BRIDGES: Follow signs to Trenton. Proceed North on Route 130 to Church Street (Rt. 607). Turn right on South Church Street, proceeding (bear to left) straight to Moorestown. From THE NEW JERSEY TURNPIKE: Take Exit 4. Follow signs to Camden/Philadelphia, Rt. 73 north. Immediately turn right at first traffic light, proceeding north on Fellowship Road to its end at Church St. (Rt. 607) turn Left on S. Church Street and proceed into Moorestown on S. Church Street (Rt. 607). W. Prospect Ave is 4th street on the Right..
From POINTS NORTH & WEST: Take 1-295 South. Take Exit 40 to Rt. 38. Turn right at the 3rd traffic light on S. Church St. (Rt. 607). From POINTS EAST: From Atlantic City area, follow the Atlantic City Expressway to Exit 31 (Winslow Blue Anchor) Exit. Continue on Route 73, past intersection (under construction) of Route 70, through Mt. Laurel area, just past the New Jersey Turnpike. Then turn right on Fellowship Road and proceed to its end at Church Street (CR. 607). Proceed into Moorestown on S. Church Street (Rt. 607). 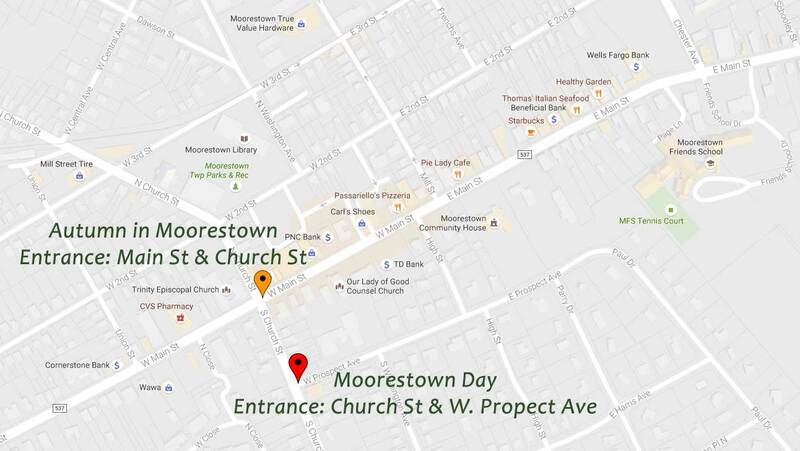 Moorestown Day Entrance – Turn onto W. Prospect Ave from S. Church St. Then turn left on High St. Autumn in Moorestown Entrance – At the corner of Main St. and Church St. Designed and Hosted by Global Information, Inc..